Everyone wants something different from the trees on their property, but there are still some overwhelming trends in terms of which trees are the most popular in Houston. Trees can brighten up your landscape, give you shade, attract wildlife, or even provide flowers and/or fruit. 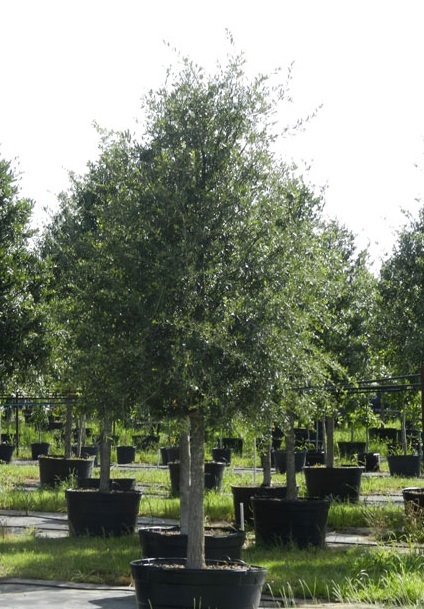 Even though you will probably be happy with any of the favorite trees for planting in Houston, you do want to take a few steps to make sure you choose the ideal ones. Think about the amount of space you have on your property, both above ground and for the tree’s roots. Don’t forget to consider soil and watering requirements as well. If you want to ensure the trees you choose to plant thrive, opt for Houston native species and consult an arborist. In many cases, you may want the tree that you choose to grow quickly. This way, you can plant it when it is still young to minimize the effort involved, but still enjoy the benefits of a fully-grown tree within a short amount of time. Cherry laurels grow quickly and are small enough to fit on most people’s property. They will typically grow 15 to 20 feet tall and are great at attracting birds to your property. Cherry laurels are a type of evergreen with glossy leaves and as long as you have soil that drains well, it can easily handle the droughts associated with Houston. Desert willows will give you gorgeous blooms in a white or burgundy during the fall months. You do need land with good drainage for these trees, but they don’t need much water after they have become established. Drummond red maple trees are perfect for those who need their plants to grow quickly and they are a Texas native. This particular tree will give you golden yellow to red leaves during the autumn, although keep in mind that Houston doesn’t typically see as much brilliant red as other areas. Drummond red maples do well in acidic, moist soil and enjoy partial sun or sun. They will also attract birds to your land, particularly Carolina chickadees. Green ashes grow quickly, but their spread is narrow compared to their height. They can reach 80 feet in height, but only 40 feet across. That being said, they are still large enough where you need to carefully consider where to plant them. Green ash does well across the country and is a better option for Houston than Arizona ash. Best of all, these trees adapt well to multiple soil types. In addition to the cherry laurel trees mentioned above, homeowners have plenty of other options for small trees that will do well in Houston. These are perfect for most people regardless of the amount of space you have available and you shouldn’t have to worry about their roots extending too far either. Opt for the possumhaw holly if you want to attract birds to your property. White flowers bloom in the spring and then red berries appear in the winter months. This tree will grow to between 8 and 20 feet and does well with shade, although you will get the best fruits if you plant it in a spot with sun or partial shade. Rusty blackhaw viburnum trees are slow growers, but will reach heights of between 10 and 30 feet when done. They eventually become a single-trunk tree, but stay a shrub for a while, limiting the amount of space they take up. Three-inch flower clusters appear in the spring and attract bees and butterflies. Small mammals and birds also love the half-inch drupes and the glossy foliage will become red during the fall. Texas olives are ideal for those who want evergreens that flower year round with enough water. The crown of these trees is rounded with a short trunk and when grown, Texas olives can measure 12 or 24 feet. They will attract hummingbirds and butterflies to your property thanks to the tubular white blooms with yellow fruits. Be aware that they also produce purple-to-yellow fruit that attracts animals to your property, but humans don’t typically enjoy. While small trees are very useful for most homeowners, those with larger property may want to consider a shade tree that can provide expansive shade for years to come. The Drummond red maple mentioned above easily qualifies as a large tree, but there are other options as well. Bur oaks are native to Houston and can spread their limbs about 50 feet wide while reaching 80 feet tall. They are also known for producing large acorns that are fun for children and attract wildlife. Chinese pistache trees are ideal for those who want some shade, but don’t need anything larger than a medium-sized tree. They live for a long time and can reach 40 feet tall and 30 feet wide when mature, giving you plenty of shade. To make it even better for Houston, this tree resists drought, pests, and heat and tolerates various types of soil. Live oaks are native species that live for a long time, but make sure you have plenty of room. After all, they can reach 100 feet in width and 50 feet in height. This type of tree is ideal for Houston since it can handle poor soil and drought, but be wary of poorly drained areas. River birches do well in Houston since they can handle the tough soil and standing water. This tree provides enough shade for most people, but takes up significantly less room than most other shade trees. It will grow to 30 or 50 feet tall and spread out 20 to 30 feet. These trees grow quickly and can live more than 30 years at time. They also help prevent erosion and tend to resist pests and disease. Remember to consult an arborist before choosing which trees to plant on your Houston property. This is the best way to ensure that you select a species that will do well on your property and that you know how to care for it. Houston, The Woodlands, Katy, Cinco Ranch, Spring, Pearland, Missouri City, Cypress, Tomball, Kingwood, Sugar Land, Friendswood, Humble, Atascocita, Channelview, Pasadena Tx.